Rapid advances in technology are forcing organizations to radically change their business processes, their organizational structure, how they position themselves in a globally competitive market, and how functional areas within the business work together to achieve common goals and ultimately---business value. Business transformation affects not only all functional areas within the business, but it also has a significant impact on how effectively IT departments can align with strategic and organizational objectives to ensure that technology solutions and services drive a measurable value for the business. Increasingly, chief information officers (CIOs) are being required to transform the way the IT department supports the business. CIOs need to become key business partners with a seat at the table and are equally held accountable for the digital value that technology brings to business. The old way of adopting and implementing new technology without justification, or satisfy specific "one-off" problems, or to drive technology strategy based upon the attitude of, "Well that's what we know best," is no longer appropriate. Today's fast-paced competitive environment where businesses want to control costs while maximizing revenue, profit margin, and value to the customer demands more. There are many facets associated with transforming the IT department into a strategic business partner. Factors that are usually overlooked include determining what IT skills are needed, what IT skills are already in place, and how the necessary IT skills are acquired. The reality is that in many organizations, the necessary IT skills tend to lag behind the necessary technology required to support the business. Rarely, is enough emphasis placed on ensuring that IT organizations are "skill ready" with the right skills at the right time. One way in which this skills gap can be bridged is to embark on an effort to define the necessary skills, assess the skills gap, and close that gap with professional development and training to acquire the new skills that are needed. Organizations can embrace and deploy an IT skills framework that will enable IT to become a strategic business partner. Ultimately, positioning them to transform the business. This paper addresses the necessary steps for deploying an IT skills framework, as well as the opportunities, challenges, best practices, benefits, and strategic results that facilitate business transformation. There are three primary game changers that are driving business transformation with respect to having the right IT skills at the right time. I view emerging technology as being multifaceted. First, it's about the technology itself. Second, it's about how that technology is deployed, adopted, and consumed. Third, you must consider how the technology is being managed. The trends in emerging technology are currently focused in five major areas: cloud, mobile, social, data, and security. These trends impact the way IT organizations must support the business. Employees need to acquire new IT skills in order to understand how these emerging technologies can drive business value, both internally and externally. Emerging technologies such as new licensing and consumption models for cloud-based services and their impact on expenditures and costs such as capital expenditures (CAPEX), operational expenditures (OPEX), and total cost of ownership (TCO), require new IT skill sets. New IT skills that are required for managing the adoption of emerging technology, such as software asset management, governance, service level management, etc., are emerging along with the technology itself. The question is, "Are your IT employees sufficiently ready and skilled enough to effectively support the adoption, implementation, consumption, and management of emerging technologies?" Today's IT workforce is segmented across three generations of people and it's rapidly including a fourth generation. This generational influx and shift is shaping how people want to work, the type of work they want to perform, and their expectations about how technology is used. Bring your own device (BYOD) and bring your own application (BYOA) are two trends that are transforming the workplace. This is placing more pressure on IT organizations to support these trends by establishing the supporting infrastructures. Increasingly, there is more emphasis on the ability to work remotely, have flexible work hours, and a trend to be less committed to a long-term job. Customers are expecting more services and are becoming accustomed to mobile services, the freedom to choose products and services, and being provided with a strong value proposition. The Internet of Everything (IoE), which brings together people, process, data, and things, is transforming how IT organizations can more effectively enable businesses to support their customer base. Ask yourself this question: Does your IT organization have the right skills to enable the business, add business value, transform the business, and stay aligned with emerging technologies and trends? If your answer is "No" or "I'm not sure," then your organization can benefit by deploying an IT skills framework to identify the skills gap and embrace efforts to bridge it. Even if your answer is "Yes," ask yourself how you will continue to maintain the skills that are required? This is not an overwhelming activity, although it takes commitment, planning, and resources. In the end it will contribute to the overall return on investment (ROI) for the business. You can think of this as being analogous to the costs associated with maintaining outdated technology. Outdated technology ultimately results in increased TCO, potentially higher OPEX, and reduced net present value (NPV). It may result in higher CAPEX. Take all of these financial factors into consideration, and your ROI decreases, your customer value proposition is compromised, you lose competitive advantage, and the cost of upgrading your outdated infrastructure significantly increases. We view any potential skills gap in a similar manner. Over time, if the right set of skills are not maintained, the skills gap will continue to increase and thus limit your organizations' ability to serve the business. Add the costs associated with attrition as employees seek new opportunities elsewhere, sometimes with your competition, and that leaves you with not only a loss of skills, but the institutional knowledge that leaves with them. On top of that are the additional costs to recruit new talent and the costs associated with them spending six to nine months, maybe more, before they are fully productive in their respective job roles. The cost of deploying an IT skills framework can often be less than the cost of replacing one or two key employees. Try to consider factors such as the ROI of increased productivity, employee morale, and the value derived from enabling business transformation. Too often organizations focus only on the costs of deploying an IT skills framework and fail to factor in the overall value that is realized by the effort. 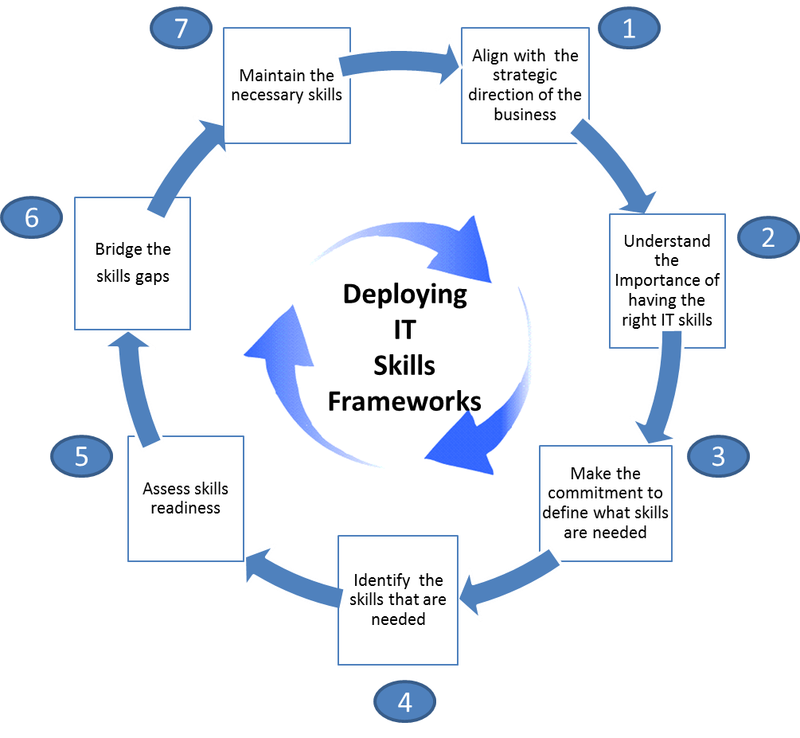 In my experience with working with IT organizations to deploy IT skills frameworks, I synthesized the process into seven key steps and/or phases. The important thing to remember is that this is an iterative process, meaning that activity does not end at the seventh step. Continual change within an organization is inevitable. Therefore, the organization must frequently reevaluate how its IT skill set stays aligned with the strategic direction of the business. Each of the seven steps is discussed in more detail below. Step 1: Determine the strategic direction of the organization. First and foremost, determining the strategic direction of the organization is a core tenet of business transformation. What does the future state of the business look like? What IT skills are required to help the business achieve its future state? What are the business stakeholders expecting from the IT organization? It's common in organizations for the perspectives and expectations of the business units to be misaligned with those of the IT organization. The first step is about gaining clarity about the strategic direction of business. Step 2: Understand the importance of having the right skills. As discussed earlier, the importance of having the right skills is realized through driving the ROI of the business, supporting stakeholders, and enabling the IT organization to support the strategic direction of the business. Having the right skills at the right time puts the IT organization in a position to adopt, implement, and maintain technological capabilities for business transformation. An additional consideration is that having the right skills is about more than just IT skills. Business transformation requires that IT professionals have more interaction with business units, understand the business goals and strategy, and know their customer base and expectations. Soft skills such as communication, negotiation, stakeholder management, project management, and client relationship management are becoming increasingly important. Step 3: Make the commitment to define what skills are needed. When deploying IT skills frameworks, the commitment to do so must exist across all levels of the organization, from executive sponsorship and champions of the cause to the general population of people who will be involved in the activity. The important thing to remember is that deploying an IT skills framework is an organizational and professional development activity, not a performance management activity. If the individuals involved in the process feel threatened by the effort then they are less likely to be committed to ensuring its success. Transparency about what is being done is one of the key critical success factors for deploying IT skills frameworks. At this point, it is also necessary to make the commitment to provide the individuals involved with adequate time and resources. Organizations often fail in their effort to deploy IT skills frameworks because they undertake the effort as an extracurricular activity instead integrating it into their daily activities. What you end up with is a less than desirable end result. A key success factor is to provide individuals with a certain percentage of their regular time dedicated to deploying an IT framework. Consider how much time will be allocated, then factor that into the overall deployment plan to establish realistic milestones. Step 4: Identify the skills that are needed. This step requires looking at the job roles that are required within the organization across the various functional areas. Identifying the necessary skills allows the organization to evaluate its current state and establish its future state. We all know that different job roles have many required skills, although in this step it's important to focus on the necessary three to four core skills. This step focuses on job roles, which are different than job descriptions. Organizations often find themselves in trouble when they focus on the existing job roles and the tasks that individuals within these job roles perform. Identifying future state job roles and skills should be decoupled from the people currently in these job roles. An additional benefit of this step is that it helps organizations identify redundancies across functional areas or job roles and where functional gaps may exist. Job roles can be defined such that they provide a clear and progressive path for individuals to move from one level to another, or even laterally, across functional areas. A final activity in this step is to gain consensus on the future state, and can involve numerous people in the organization including IT executives, the line of business managers, and HR. Step 5: Assess skills readiness. Once the future state job roles have been defined, the next step is to assess the skills readiness of all the individuals in the organization. Remember that this is a professional development activity, not a performance management activity. It enables individuals to identify their skills gaps, and sets the stage for professional development opportunities. An effective skills assessment should include identifying skills gaps at the individual level, within the overall functional area, and ultimately throughout the entire IT organization. I think of this in terms of a scenario where a CIO is tasked with supporting a major business transformation effort. By having visibility into the overall skills gaps that exist within the organization, the CIO can make a more informed decision on what will be required to support the business transformation effort through upskilling individuals, identifying which individuals already have the necessary skills, or what skills need to be acquired. An additional benefit of assessment is that individuals may find that their skills are misaligned with their current position and may identify other positions where they can be more successful. Step 6: Bridge the skill gaps. At this point individuals can establish development and training plans that are aligned with the strategic skills that are required. Having visibility into the skills gaps that exist enables the organization to best determine where development and training activities should be focused to maximize economies of scale for development and training budgets. In situations where skills are immediately required, this helps the organization decide what new skills need to be acquired through hiring or contracting to individuals who have those skills. Step 7: Maintain the necessary skills. This is the beginning of the iterative process for minimizing the skills gap. As individuals acquire new skills through development and training activities, they can reassess themselves. As business transformation becomes increasingly important for businesses, their strategy will evolve accordingly and require changes to reshape their structure, processes, organizational structure, etc. Consequently, this necessitates a continued effort to evaluate the IT organization's strategic skills readiness. By the time an organization has reached this step in deploying an IT skills framework, the majority of the investment has already been made. Like technology, maintaining the IT skills framework will continue to provide value to the business, whereas not maintaining it will once again contribute to an increasing skills gap. What's the best approach for determining how to implement an IT skills framework? Should we build it ourselves or should we use an existing IT skills framework? These are common questions organizations ask when looking at deploying IT skills frameworks. Of course, there's always the question of "How much will it cost?" to which I often respond "How much will it cost you if you don't find a way to bridge your skill gaps?" There are always two considerations: to build or buy. Building your own skills framework is a time-consuming process, especially if you want to realize the highest longitudinal value from the framework. Even leveraging an existing framework for integration into your proprietary framework may require additional licensing fees or the costs of negotiating contracts to use the intellectual property. Other considerations are how robust do you want your framework to be and do you want it aligned to the overall industry perspective of what are considered core IT skills? Ease of deployment and use, interface functionality, and the ability to maintain and management, are additional considerations. Purchasing or licensing an existing IT framework, along with an application that enables you deploy, maintain, and manage it, are other options to consider. Earlier we discussed that the cost of adopting and deploying a framework can be minimal in comparison to the value it will return to the organization. Consultancy services can be part of the package to help you jump-start the deployment and then efforts can be brought in-house. What should comprise an effective IT skills framework? The answer to this question has numerous components. First, an effective framework should include the set of skills that are core to the majority of industry-recognized IT job roles. These core skills are generic in nature and are not associated with specific technologies. Remember that a framework helps define the core skills for a job role and are not a job description. That said, an effective industry framework should have the capability to accommodate additional skills that may be missing from the base framework. Second, an effective IT skills framework should provide the ability to assign multiple levels to core skills. This allows for creating job roles that allow for vertical progression through a functional organization. For example, an associate business analyst will not have the same level of experience in a core skill such as requirements gathering that a more senior business analyst will have. Leveling is important during the process of assessing skills gaps to ensure that individuals are assessing themselves against the appropriate level. This also helps with career progression. Associate business analysts can assess themselves against a more senior-level position to determine their level of readiness and formulate professional development plans that will help them advance. Leveling provides clarity and transparency for individuals because they know exactly what is needed to move to the next level and that the same set of requirements is equally applied to all individuals. Third, an effective IT skills framework should provide the capability to add the additional soft skills, leadership skills, and common corporate or organizational skills that are required across all job roles. Skills must also be transferrable across multiple job roles. It is increasingly common for IT job roles to have project management, business analysis, and stakeholder management as core skills in the context of business transformation. Some organizations also integrate additional competency frameworks into their IT skills frameworks. Ask yourself the following questions when deciding to deploy an IT skills framework. Do you want to effectively support your organization's business transformation efforts by having the right IT skills to do so? Do you know what the future state of your organization's skills readiness should be? Do you value the net worth of the skills and institutional knowledge of your current employees? Do you have the right skills to quickly deploy emerging technologies that will drive business value? Do you currently have a mechanism in place to effectively assess skills gaps and your organization's level of readiness? Do you know what professional development and training activities are providing the most value in bridging skill gaps? Do you want to retain the talent you currently have and enable individuals to acquire new skills to increase productivity and morale? Do you want to differentiate your business from your competitors by having the right skills at the right time to capitalize on new market opportunities through emerging technologies? Do you want to provide the best experience for your customers through the implementation of emerging technologies? Do you want to invest in your business in ways that will positively impact ROI? There is no right or wrong answer to the above questions. However, taking them into consideration will provide you with additional insights. In essence, each question can be transformed into an overall benefit for your organization. It can also drive business transformation by adequately addressing the need for strategically aligning the readiness of the IT organization to the overall business strategy. Businesses are embracing business transformation as a means to help them proactively deal with rapidly changing market conditions. Emerging technologies are enabling businesses to respond to these changing market conditions by enhancing operations and processes for delivering new products and services to their customers. As a result, IT organizations are increasingly being held accountable to bring digital value to the business and participate as a strategic partner within the business. To this end, IT organizations must ensure they have the right skills at the right time to support the strategic direction of the business. Deploying an IT skills framework provides an opportunity for IT organizations to determine their level of readiness by identifying where skill gaps exist and establishing a framework for bridging these gaps. Investing time and resources into identifying and bridging skill gaps establishes an opportunity for IT organizations to contribute to overall ROI and value for businesses. James A. DiIanni has over thirty-eight years of experience in the IT industry. He has worked with numerous large IT organizations to implement IT skills frameworks and has firsthand experience in understanding the process, challenges, opportunities, and benefits of doing so. James is an Accredited Skills Framework for the Information Age (SFIA) consultant with SFIA.org. Throughout his career, James has been involved with training and certification and the resulting benefits they bring to organizational and professional development.